Surfing television channels, I unexpectedly turned to a show on our local station that led to a very fun Saturday morning. 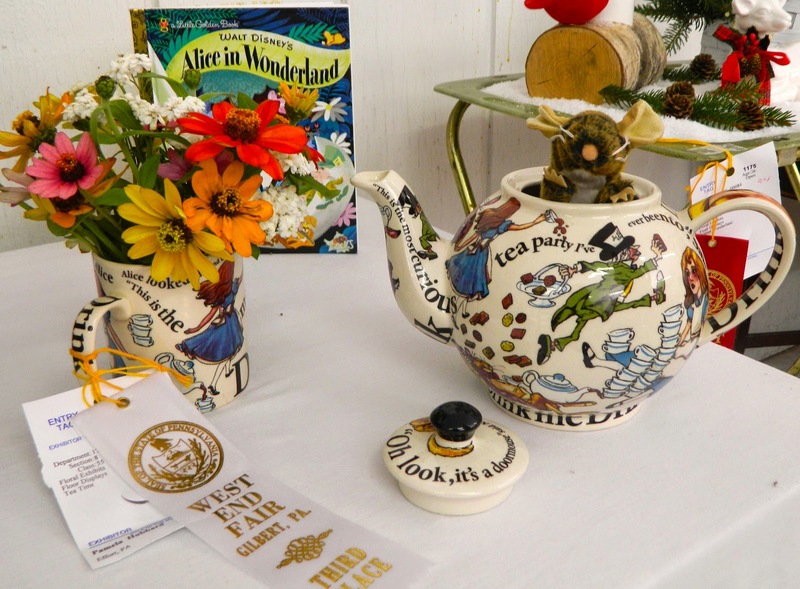 It was an episode of "Talk of the Town" in which Marie and Kim made fairy gardens at The Potting Shed, a nearby arts and crafts supply store. 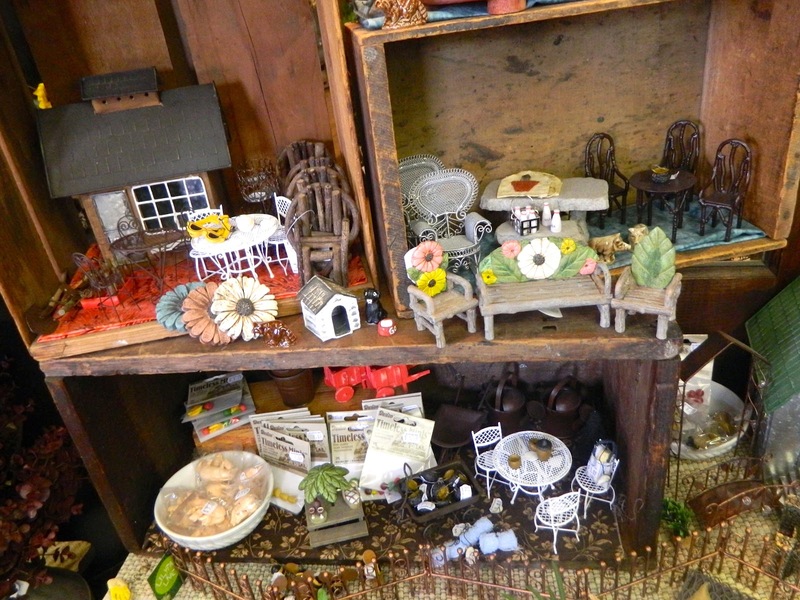 The Potting Shed was already my best source for miniature garden supplies, but I didn't know they gave fairy garden workshops. I quickly enrolled in last Saturday morning's class. The Potting Shed is an Aladin's Cave for the hobbyist. 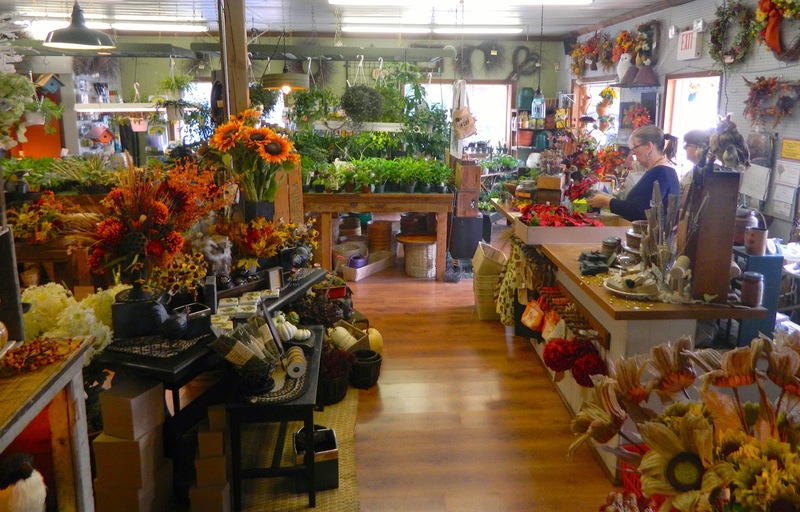 In addition to arts and crafts, they stock home decor items, potted plants, and gardening supplies such as potting soil. I always feel happy browsing this store. My instructor's name was Judy. She soon put me to work. 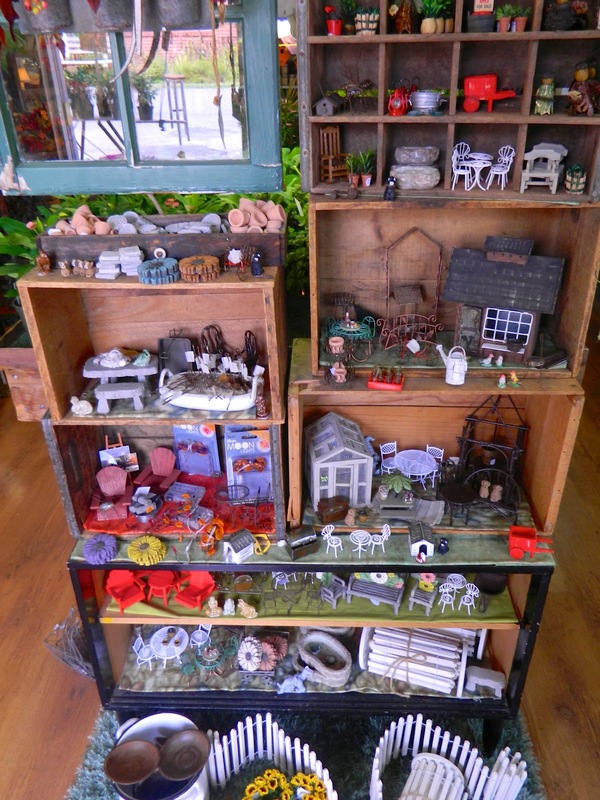 My first task was to choose a container for my fairy garden. I decided to make an indoor garden this time and wanted something small and portable. There was a wide choice available, and my first pick was a beautiful glazed dish for bonsai. I decided, however, that I preferred a deeper dish to enable better root development -- although you don't want the plants to grow too big, so the shallow one would probably work. Judy and I agreed a container with a drainage hole would be best. 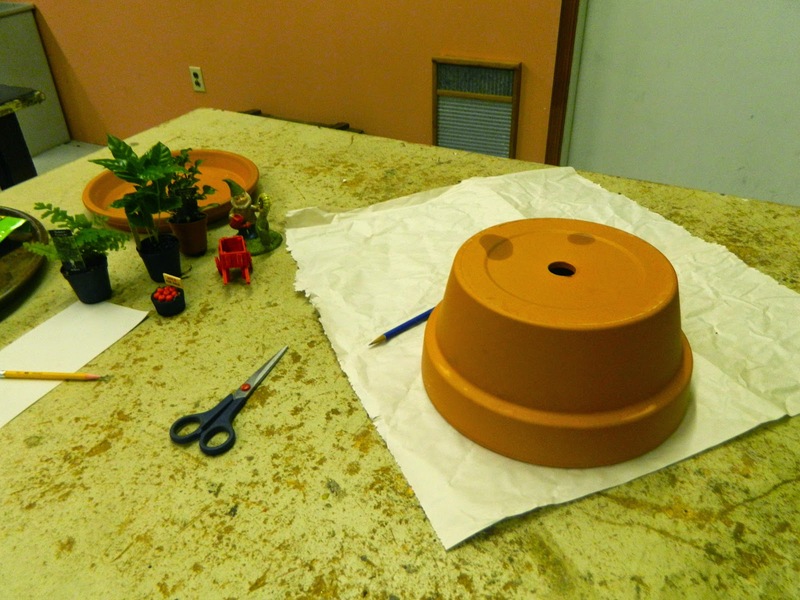 I settled on an Italian terra cotta pot with a saucer. Love the garden in the Radio Flyer wagon. My next job was to choose ornamentation. Judy asked me what theme I had chosen. I told her I would like to make a gnome garden (as my previous mini gardens all have fairies). I chose a gnome watering a sunflower, a red cart, and a basket of apples. 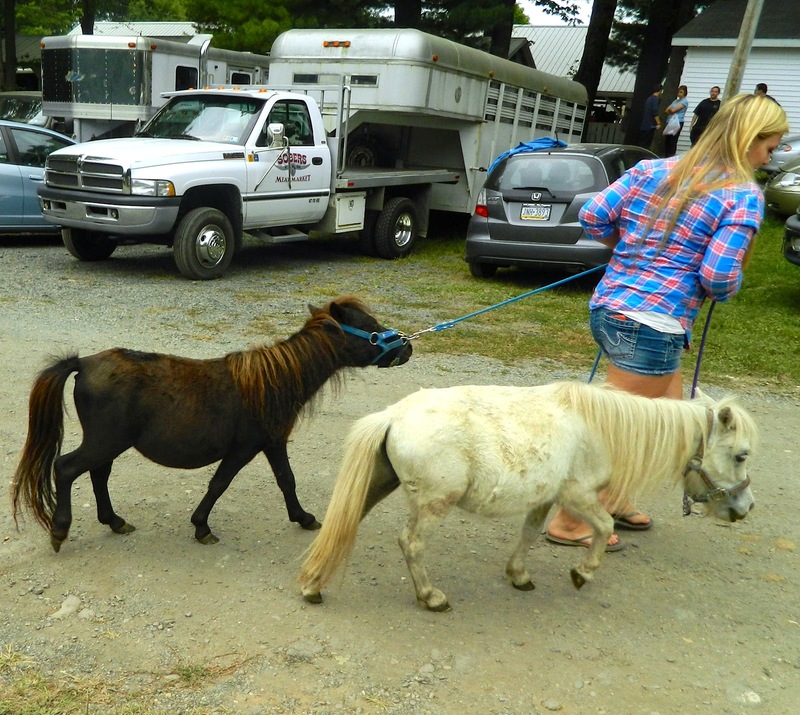 They were all pretty much in scale. I saw how they could tell a story. 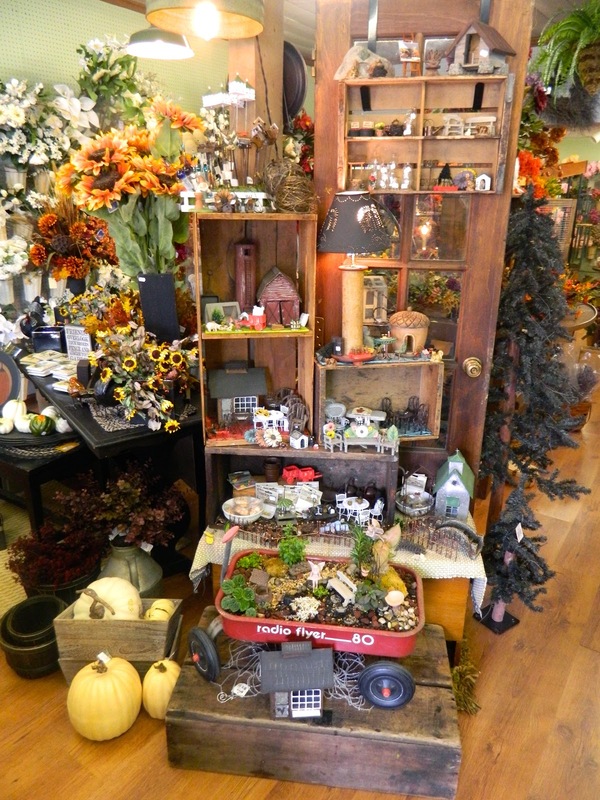 There is a great choice of items for every theme of miniature garden. 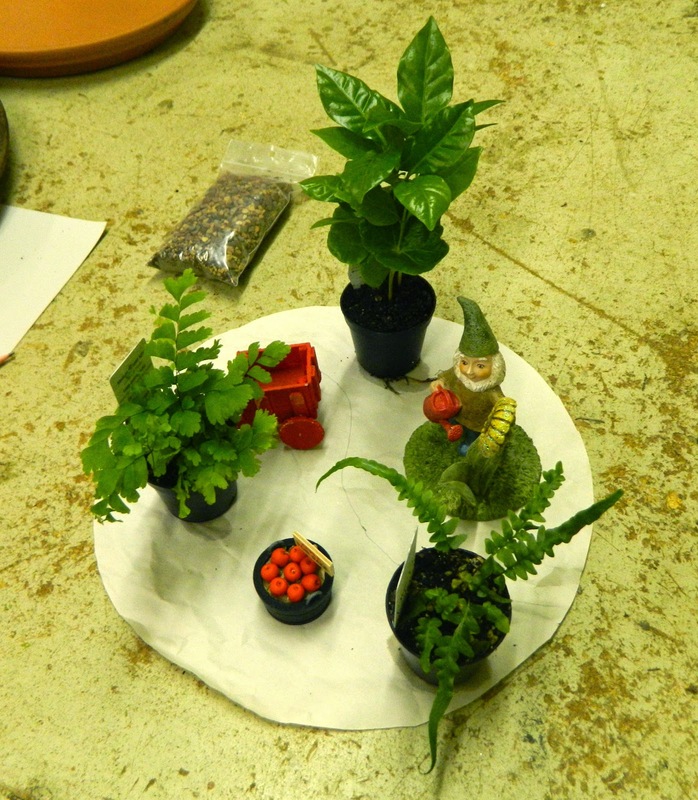 Now it was time to choose the plantings for my gnome garden. With the size of my container in mind, I chose just three plants. They were all house plants, originally grown in Florida, but I do not intend to place them outside where they would not survive our winter. None of the three are 'miniature plants' as such and can grow quite big, but that will take a while. I have no qualms replacing them if they grow too big, or just don't survive (I'm not very good with house plants.) I have compiled a resource of hardy miniature plants, such as miniature hostas, that I can refer to, if necessary. I spent a long time picking out three little plants. I think Judy's next step is brilliant. 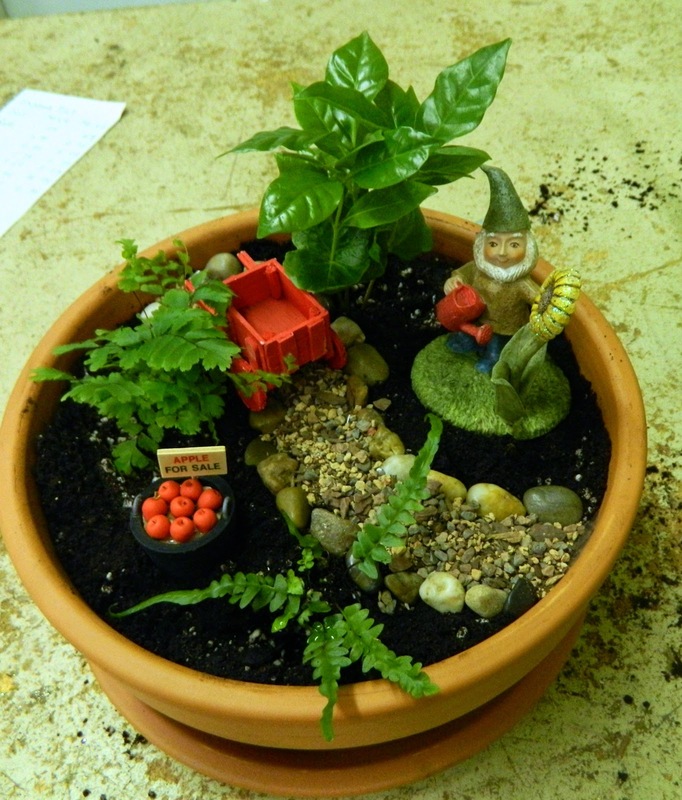 It is one that my grandson, Jon, and I haven't employed with our previous mini garden attempts. She told me to tip over the container on to a piece of paper, draw round the pot, and cut out a template. Then she instructed me to arrange the pieces and plants on the template before filling the container.This way it is easy to see if there are enough items, or not enough, or if the plants are too big, and if the pieces work well together. (One of my plants was too tall, so I changed it at that point.) Judy and I like the way the color red is repeated in my arrangement. Arabica 'Coffee' at the back, Maidenhair 'Fritz Luthii' on the left, and Dragontail fern front right. 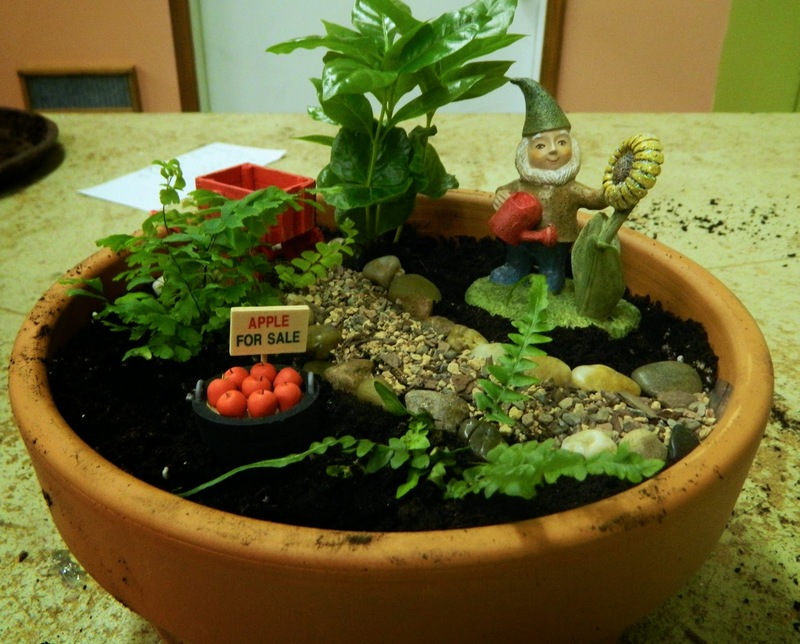 Isn't the finished gnome garden adorable? Cedric the Gnome was an excellent gardener. 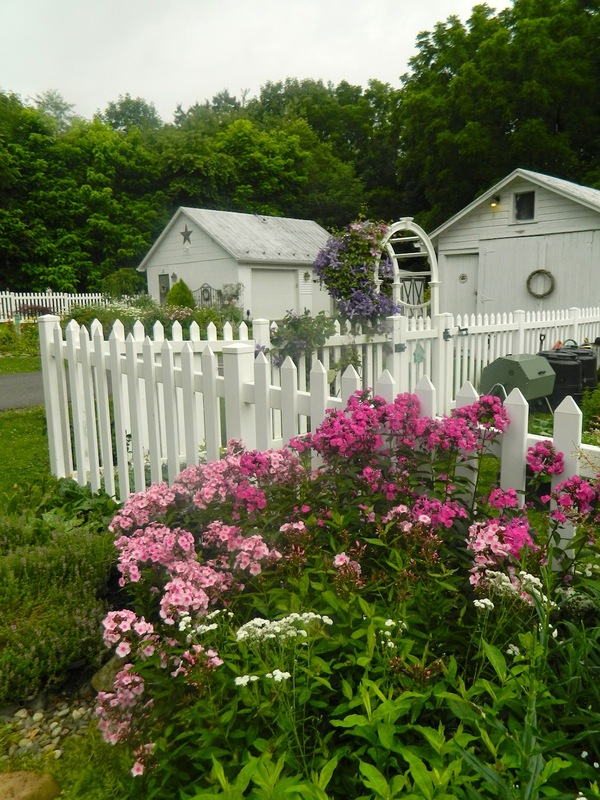 He grew flowers, vegetables, and fruit. One day, he picked red, juicy apples and carried them in his red cart to the front garden where he placed them for sale. He was just about to return his cart to the orchard when he noticed his prized sunflower was drooping. 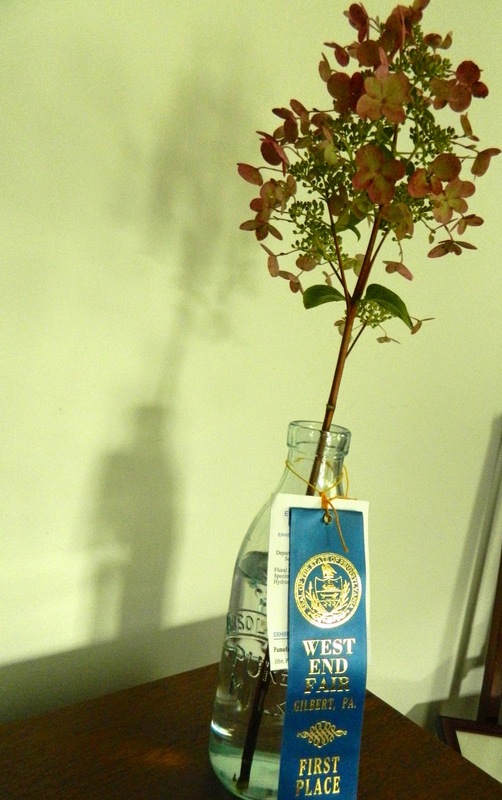 Quickly, he filled a water can and gave the flower a long drink. 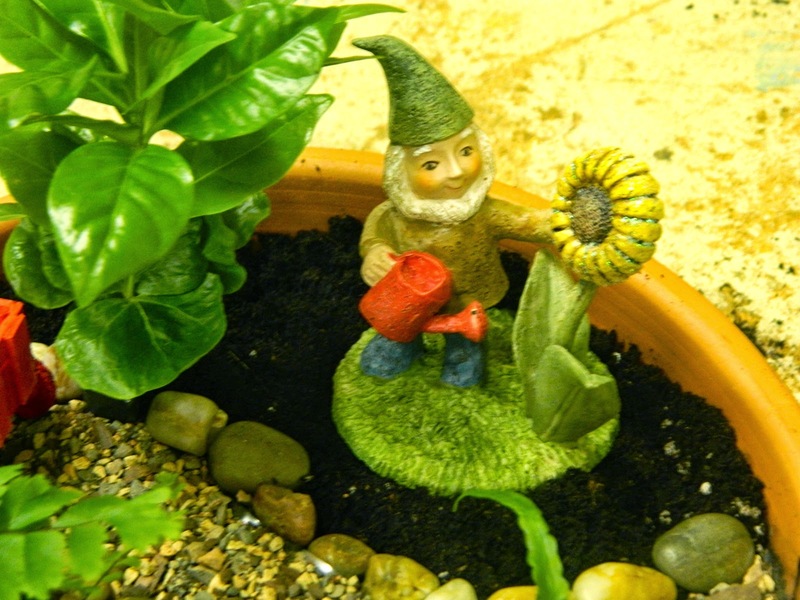 Cedric the Gnome was an excellent gardener. 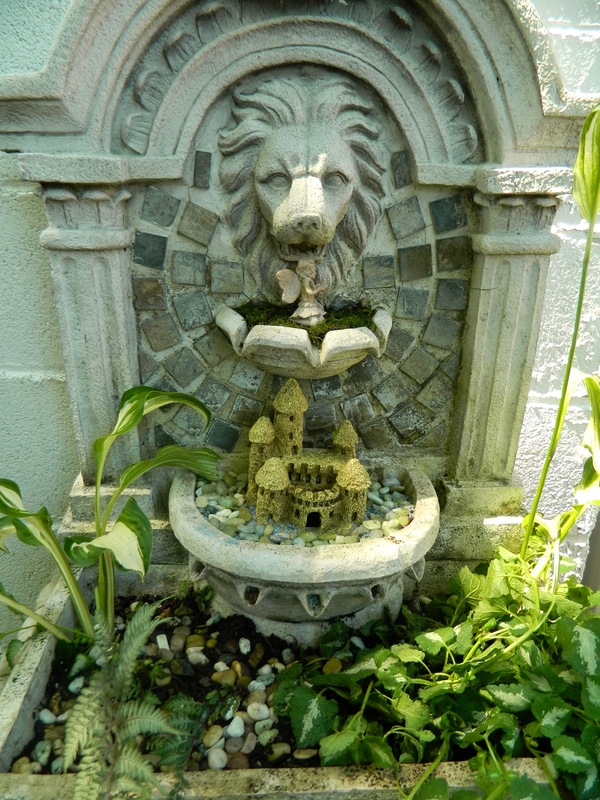 Jon created a castle garden in a broken fountain (it leaks when pumping water and we haven't been able to fix it.) We put moss in the top dish for a soft resting place for a fairy. In the middle dish we put a castle (found in an aquarium store.) Jon used blue stones to make a moat. In the bottom I planted shade-loving hostas, ferns, and lamium. The castle garden is in my shady 'Stone Garden' area. 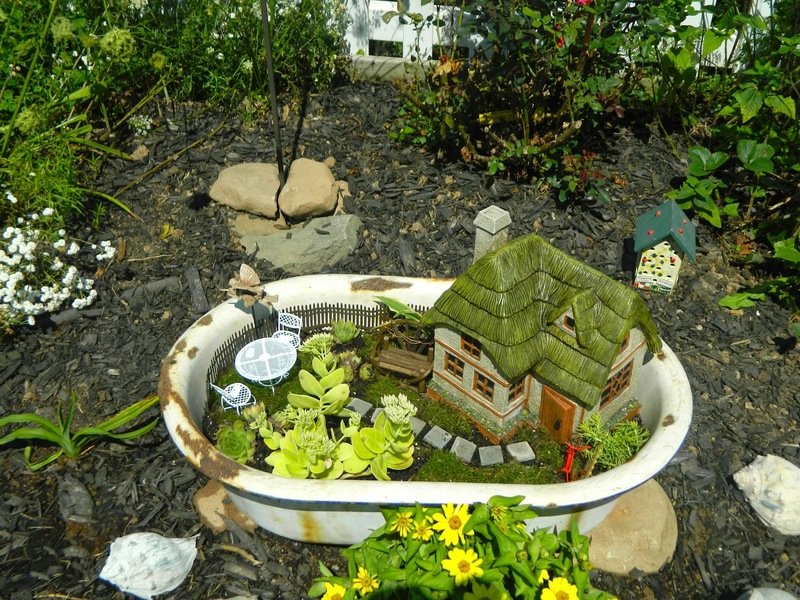 Jon created a super garden scene in an enameled tub that H.H. was bathed in as a baby. Jon couldn't believe his pappy was ever small enough to fit inside. 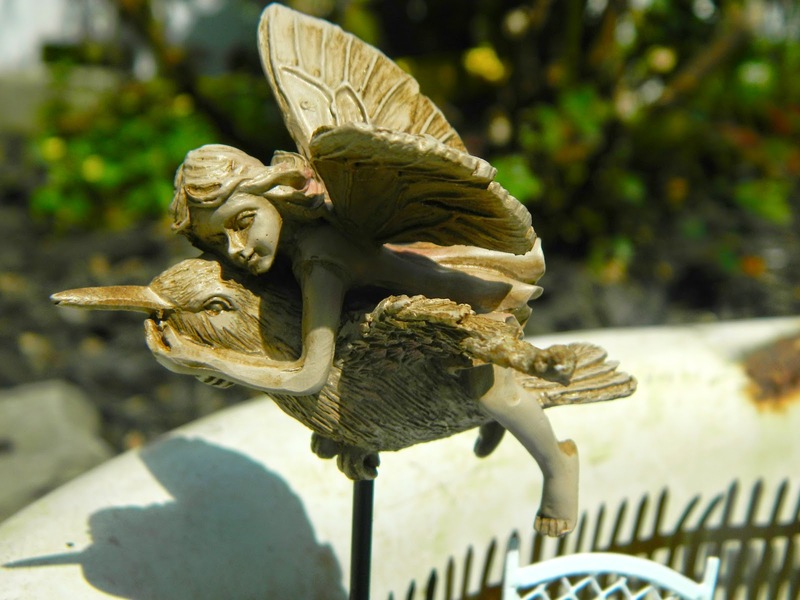 The scene includes a house, a bicycle against a fence, a bench, and a fairy riding a bird, plus other garden furniture. The plants are moss, sedums, and succulents. Well done, Jon. We will continue our hobby during next summer's vacation. 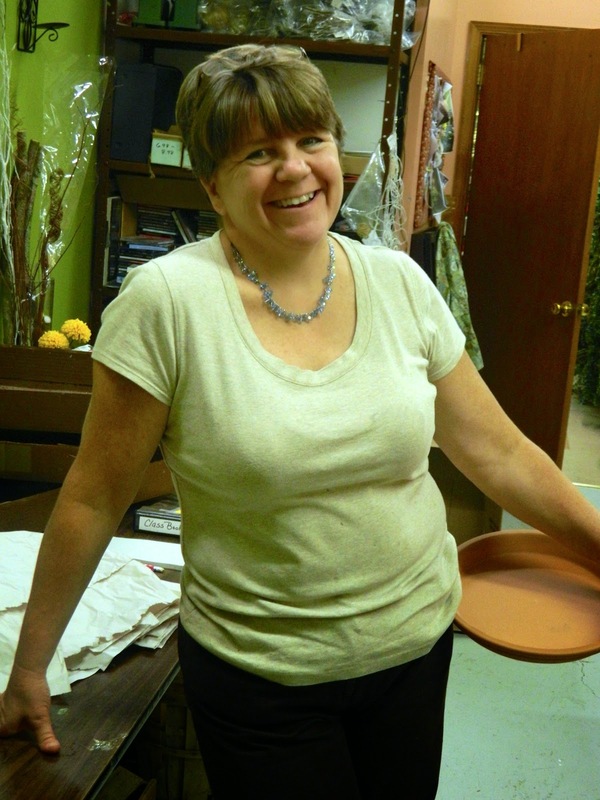 Also, my thanks to Judy at the Potting Shed for a fun and productive morning! I learned a lot. 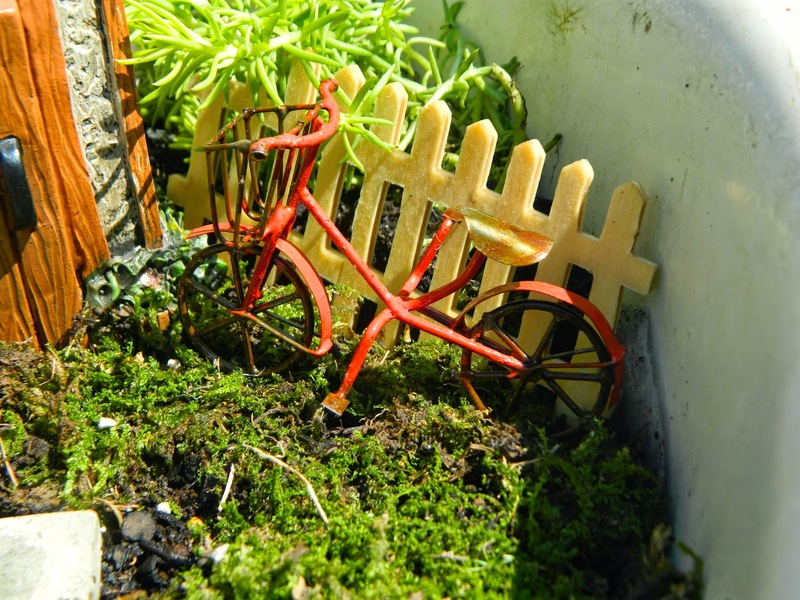 This posting is the fourth in my 'Making a Miniature Garden' series. You can read the other three parts here, here, and here. If you haven't made one yet, do try this enjoyable horticultural activity, dear gardening friends! 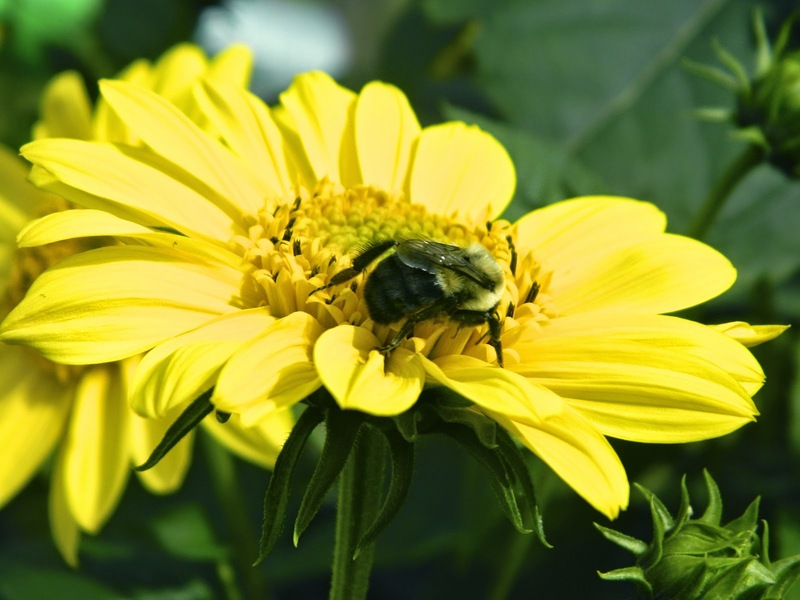 I am profiling seven of my favorite fall bloomers for September Garden Bloggers' Bloom Day starting with my perennial sunflower. 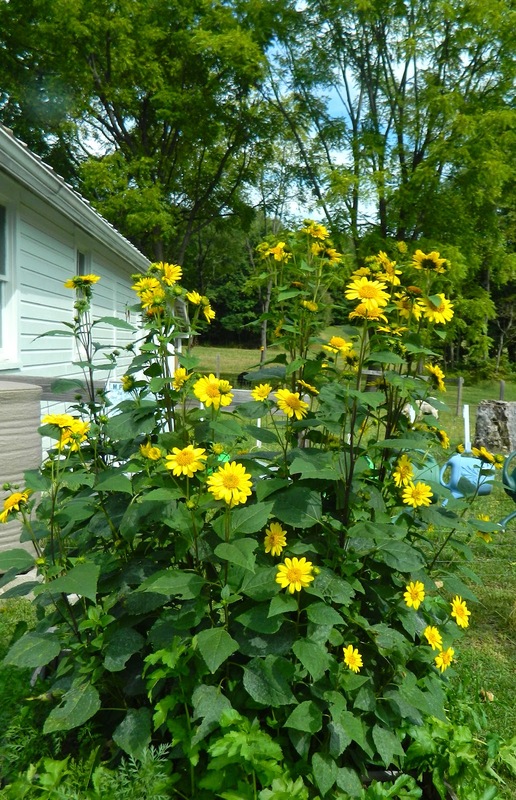 This upright plant flowers freely in late summer and fall. It can reach 6 feet high and 4 feet wide. It will grow well in ordinary soil if it is not too dry. It requires full sun. As you can see from my first picture, I grow mine in planters, because they can be rather aggressive, so I like to contain them. 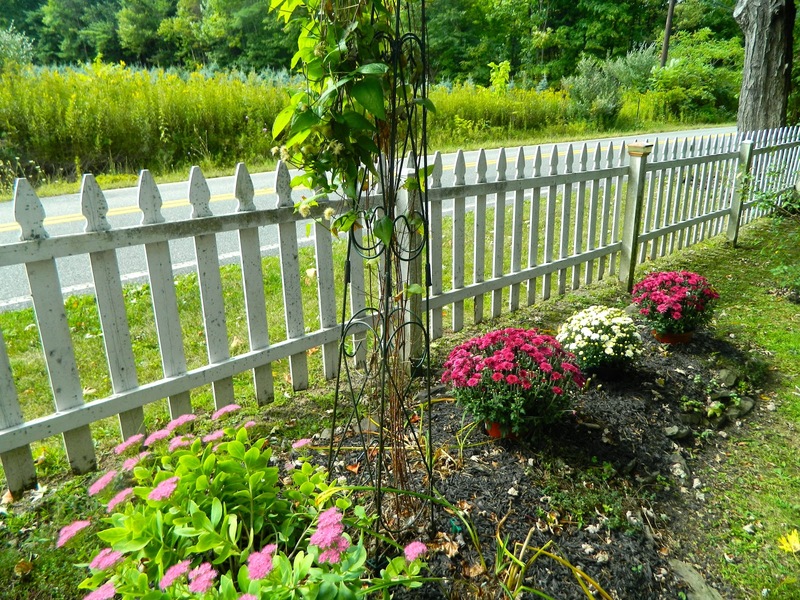 Also, that area on each side of the arbor is very wet, and none of the shrubs and vines I've planted have survived there, but pots work well. I don't deadhead, but leave the seeds for the birds. I've had no problems with this plant until this year when it developed some powdery mildew. Next year, I plan to spray early with an organic fungicide. Few butterflies, this year, but hundreds of bees. 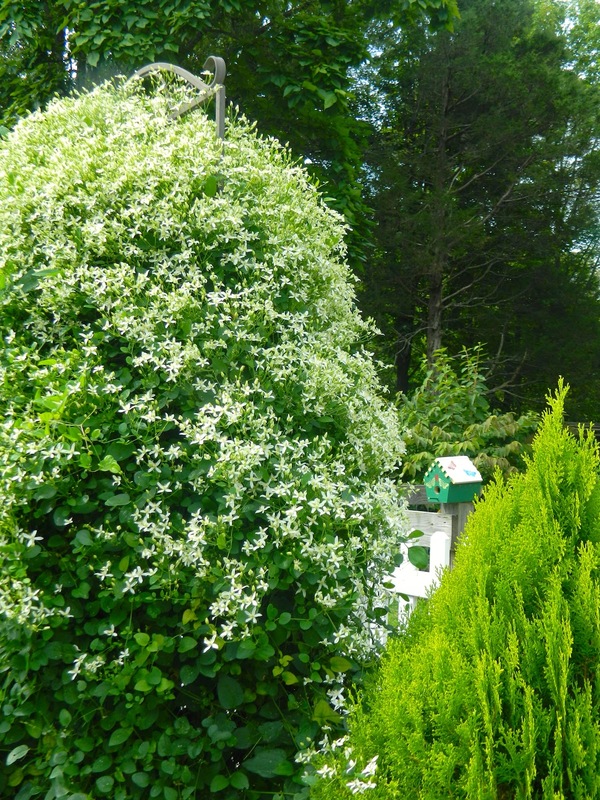 Gardeners either love or hate Sweet Autumn Clematis vine. Every September, it grows up a wrought iron trellis in my garden to create an impressive column of fragrant, creamy-white flowers which I love. It is a rampant grower that can reach a height and spread of 15 to 30 feet in zones 5 - 9. The native species (C. virginiana) is not as prone to self-seeding and spreading, but I further control mine by cutting it back almost to the ground after flowering. I monitor its growth through the shrubs on each side. 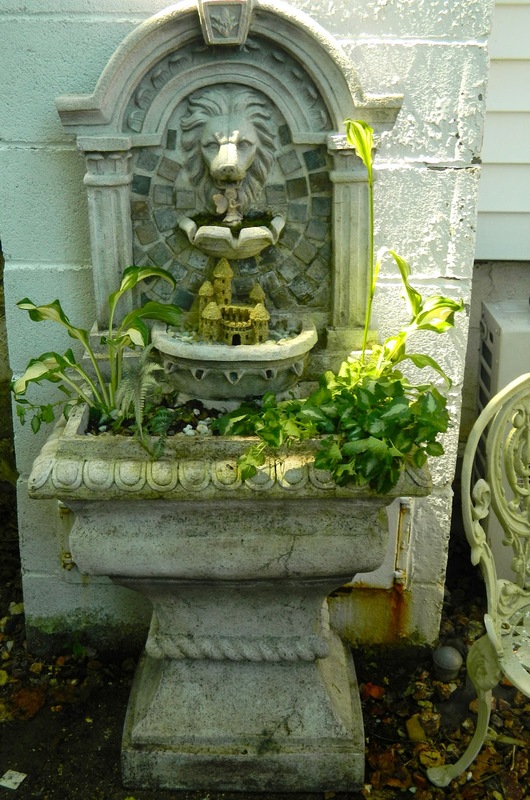 I find this comparatively high maintenance plant worth the trouble; many do not. 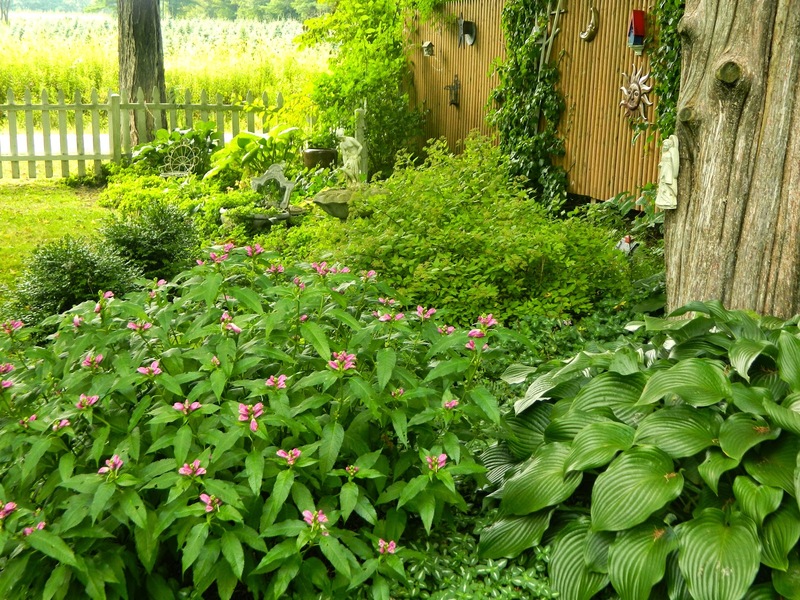 If you like it, grow it in average, medium, well-drained soil in full sun to part shade. In summer, the silvery gray foliage of caryopteris x clandonensis 'Dark Knight' shines in my cottage garden border, but it comes into its own in fall when it blooms. 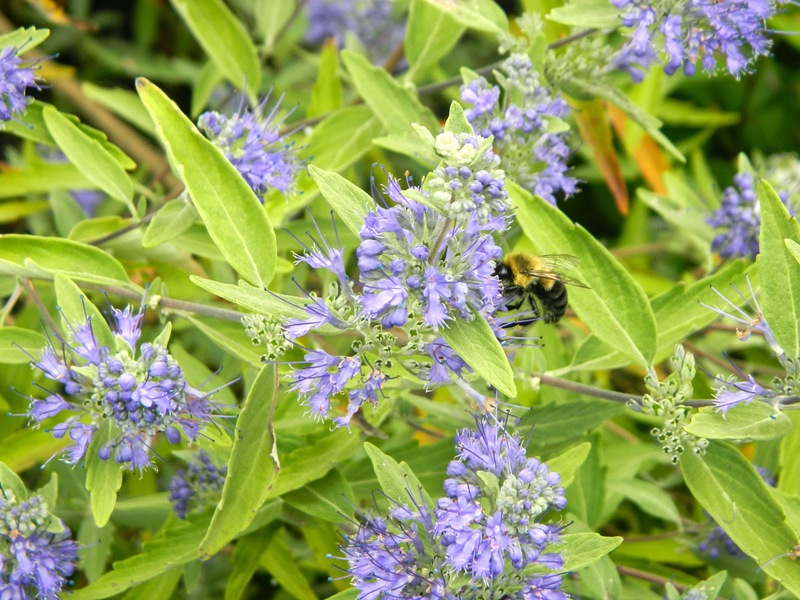 The fragrant, small, dark purple-blue flowers are magnets for bees.This compact, mounding shrub grows up to 3 feet high and 5 feet wide in zones 6 to 9. Blue is probably my favorite flower color and this patch of blue in my fall garden always makes me happy. I usually give it some protection from the winter weather, but didn't last year because of ill health and I'm thrilled it survived the worst winter ever. My clump of turtlehead has grown slowly because I planted it in dry soil, which it tolerates while preferring moisture. I love the blooms that bring late-summer color to my shade garden. This native plant, found in zones 3 to 8, grows 3 feet high and 18 inches wide. Chelone can be propagated by soft-tip cuttings in summer or by division or seed in fall or spring. My camera captured the bee before it disappeared into the blossom. With my love of blue, I was excited to add light blue asters to my perennial border last year. Unfortunately, they did not survive the harsh winter. (I think that was the cause of their demise.) I am glad to say, however, that sedum 'Autumn joy' is as beautiful as ever this year. As summer blooms begin to fade, the daisy-like flowers of fall 'mums are a welcome addition to the garden. I add pots to every border choosing colors that compliment other late bloomers. I buy the so-called 'hardy' variety, but there's no guarantee they will survive the winter -- none pulled through last year. 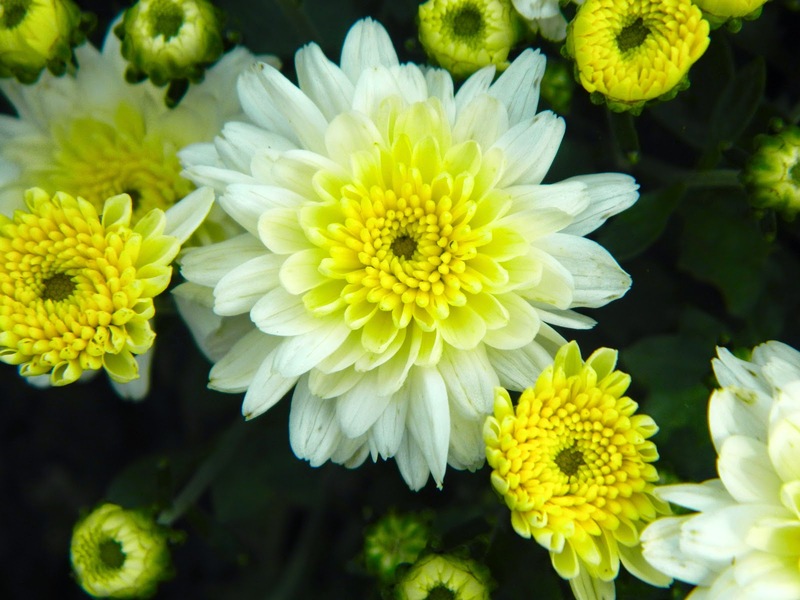 Chrysanthemums date back to 15th century BC and according to mythology they symbolize optimism and joy. The entry garden begins to look like autumn, with scattered leaves and fall mums, even with the summer 'welcome' slate and wreath still in place. 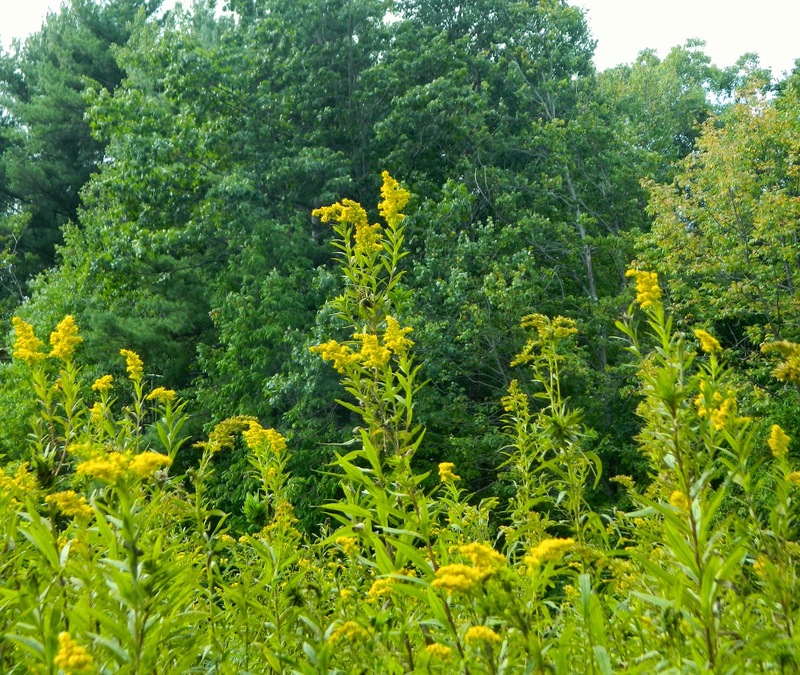 The goldenrod Solidago Rugosa, my last plant profile for this fall posting, lines the edges of our fields. When it appears around my house I know the garden season is nearly over. I believe rugosa means rugged, and if so this plant lives up to its name. 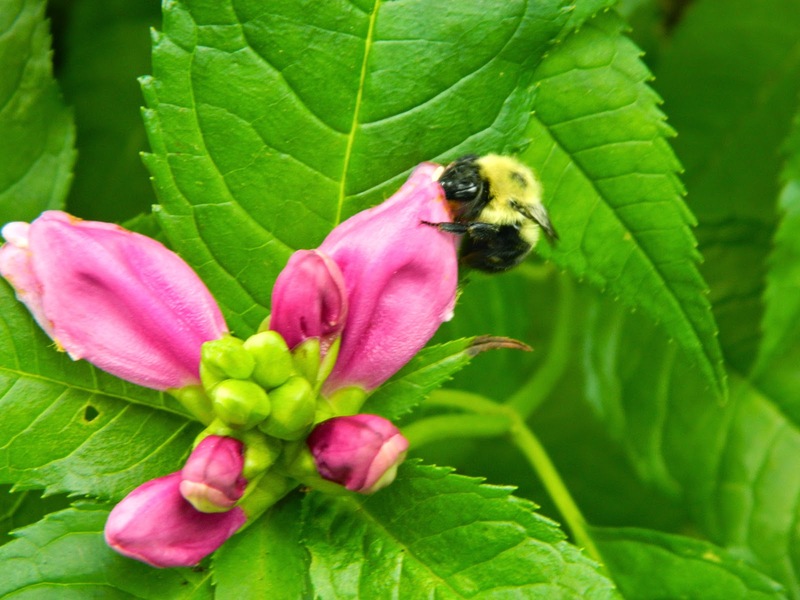 Bees and butterflies love its dense plume-like flower panicles. 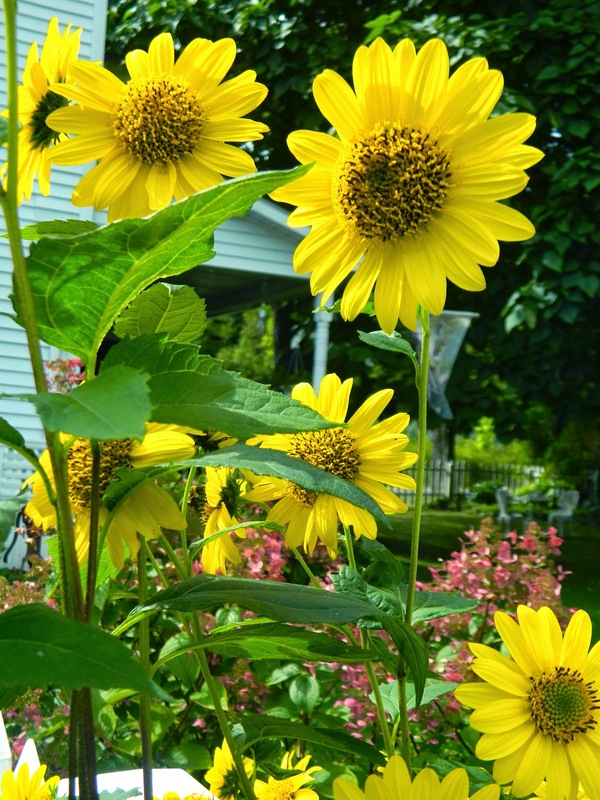 It grows in full sun to part shade, in zones 4 to 9, thriving in moderately fertile soil. I am linking this posting to Carol's lovely blog, May Dreams Gardens, where she hosts Garden Bloggers' Bloom Day every month on the 15th. Be sure to visit there if you haven't already! What are your favorite fall blooms? Oh, No! There's Powdery Mildew on My Plants! Powdery mildew is rampant in my garden this year. I believe I've managed to control the problem enough that you may not notice it as you walk around, but in spite of my best efforts, I haven't eradicated it completely. 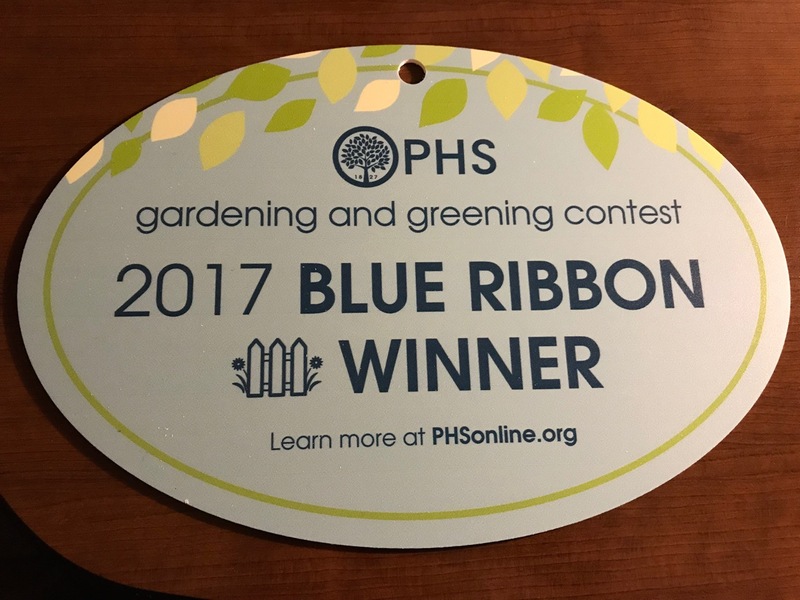 Powdery mildew didn't attack last year, although there was no shortage of other troubles, as you will learn if you click on this posting: Garden Pests and Other Problems in Paradise. So what is powdery mildew? what are the causes? and what control measures are available? 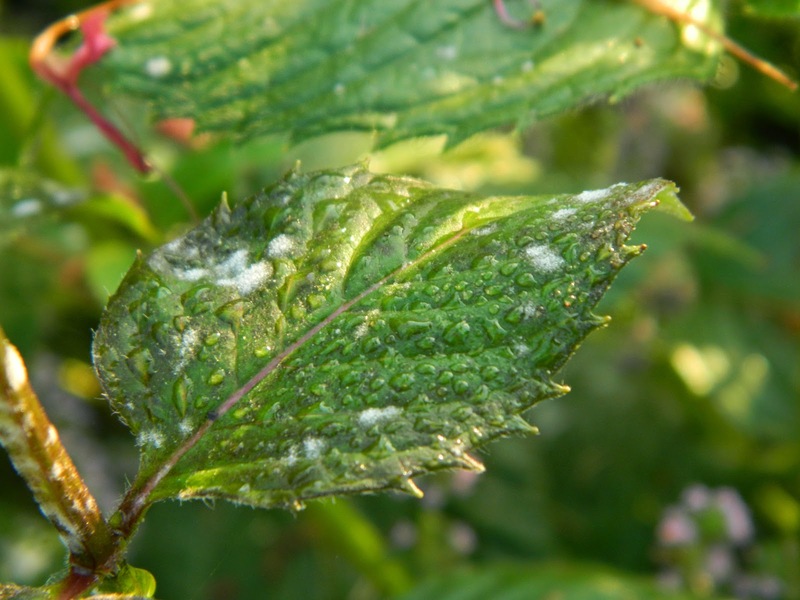 Powdery mildew is a fungal disease that causes white spots on the leaves of some plants. The infected plants in my garden this year are phlox, bee balm, perennial sunflower, and zucchini. It is a destructive, disfiguring disease. The grayish white, powdery patches appear on the foliage, starting at the bottom of the plant, in summer. The blotches, usually circular in shape, grow together into a continuous matt of mildew. The lower leaves often turn yellow and drop prematurely. The fungus removes nutrients from the plant during infection and may result in the decline of the plant. 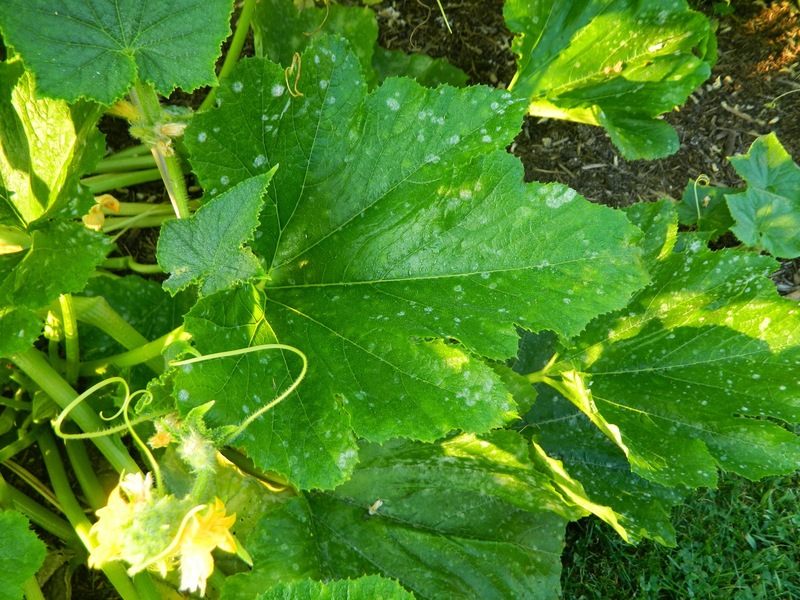 Powdery mildew on zucchini foliage. Wind spreads the spores of the fungus. The fungus can survive during winter on plant parts and debris where tiny, black, fruiting bodies known as cleistothecia develop. *One of the characteristics of a cottage garden tends to be close plantings, so I have to be very attentive to point number three. 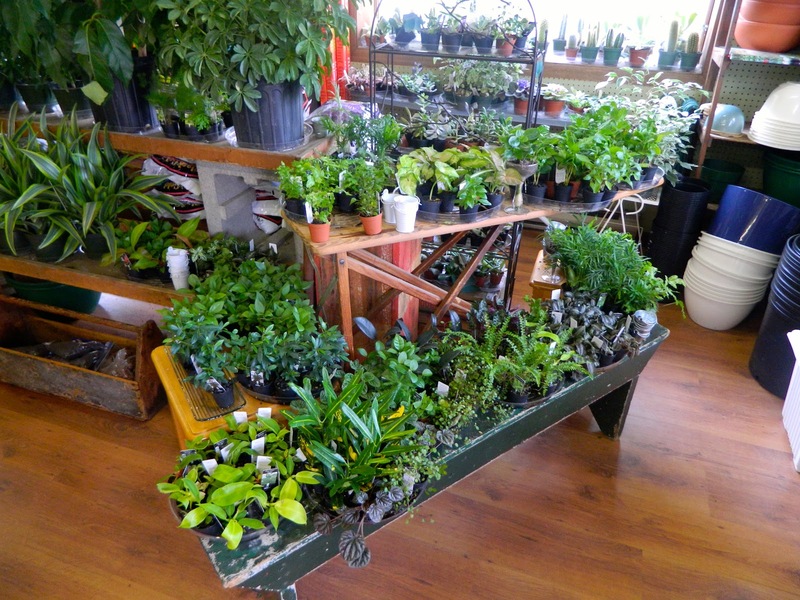 Plant sun-lovers where they will get at least six hours of sunlight each day. Plant in open areas away from fences or walls where air circulation is poor. Because I plant fairly close together, I remove all but five or six stems of the susceptible plant when it is about six inches tall to improve air movement. I divide my plants every two-to-four years for continued air circulation. 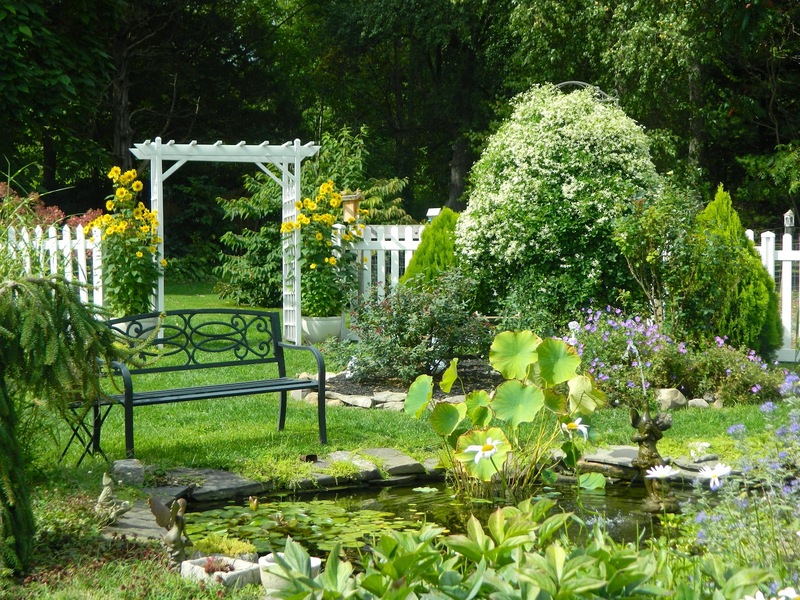 Water regularly, but soak the soil instead of the plants to prevent disease development. 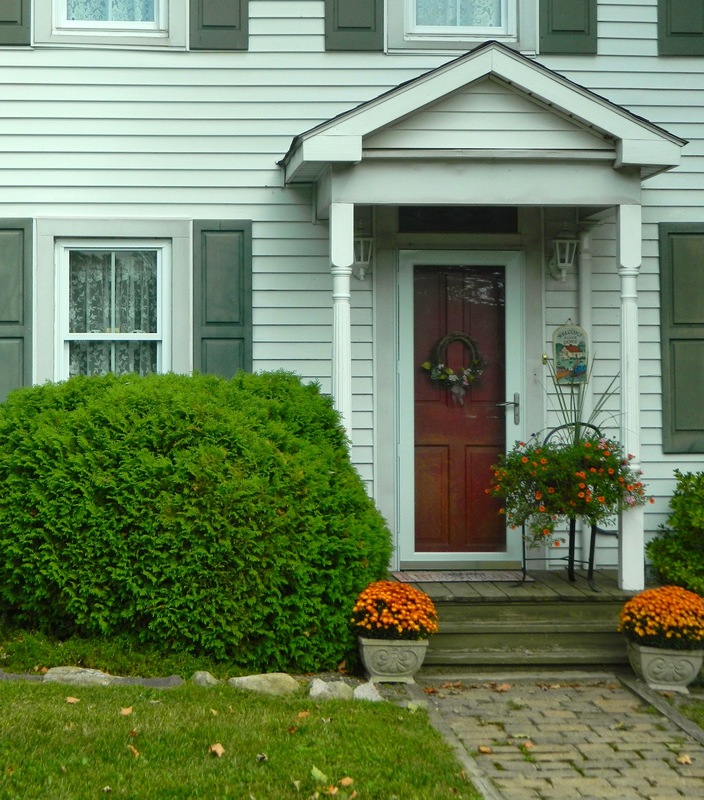 In the fall, remove and destroy all mildew-infected plant debris to reduce the likelihood of disease the next season. 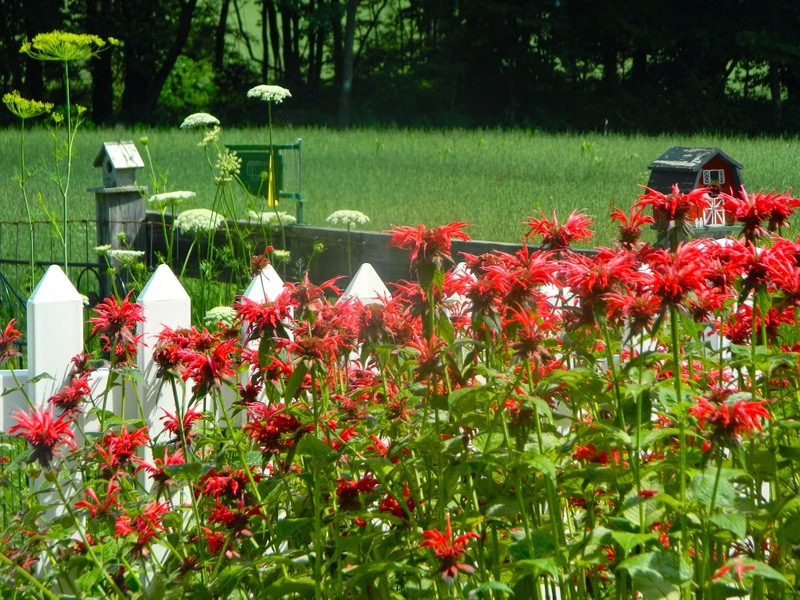 I systematically remove stems of bee balm, 'Jacob Cline,' to aid air circulation. I hate using chemicals of any sort, but there are some organic fungicides for controlling powdery mildew. To be on the safe side, I spray only in the very early morning before the pollinators are active. Also, check that the particular fungicide is safe on the plant you are treating. 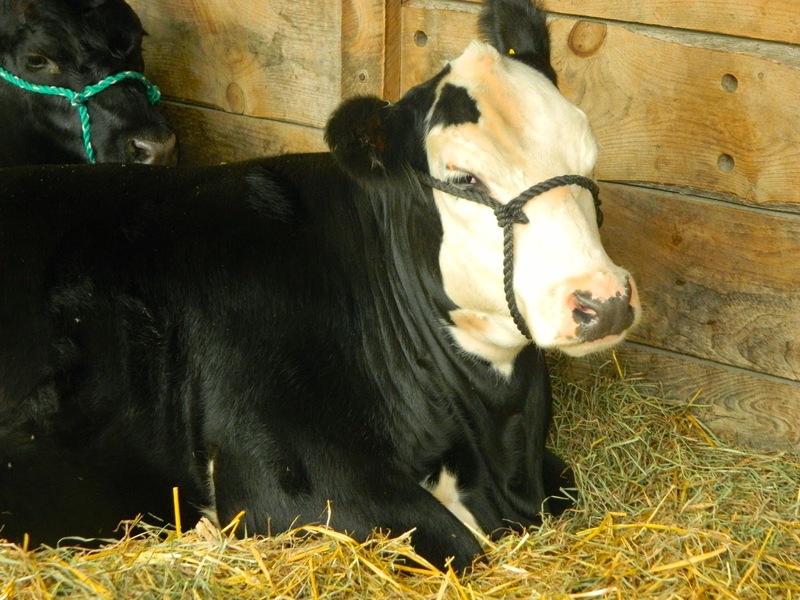 Begin a fungicide program when the first white spots appear. Spray the upper and lower surfaces of the leaves, covering thoroughly. Repeat every seven to fourteen days. Follow all directions on the label. 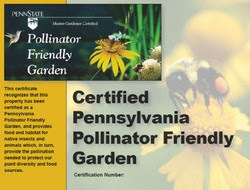 Contact your local Cooperative Extension Office for more information. 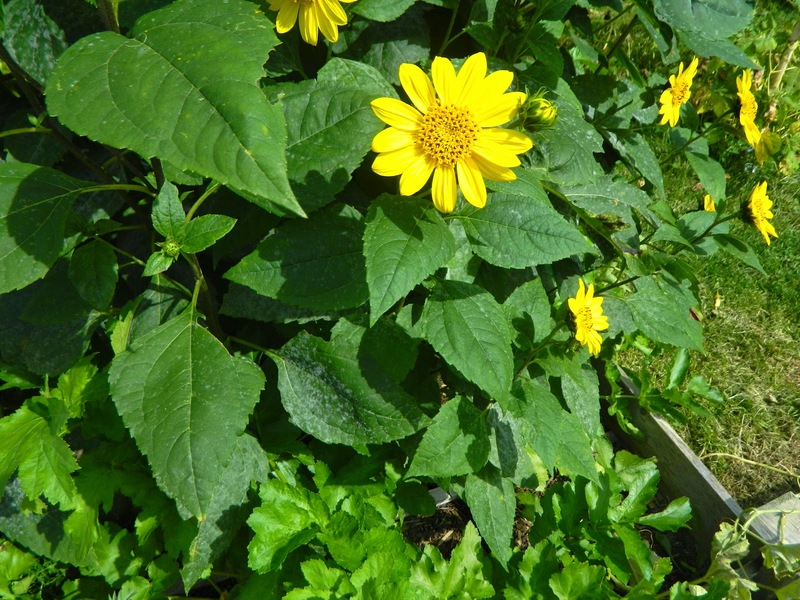 Just a few small white spots have appeared on the perennial sunflower plant. For the best long-term solution choose plant cultivars resistant to powdery mildew. 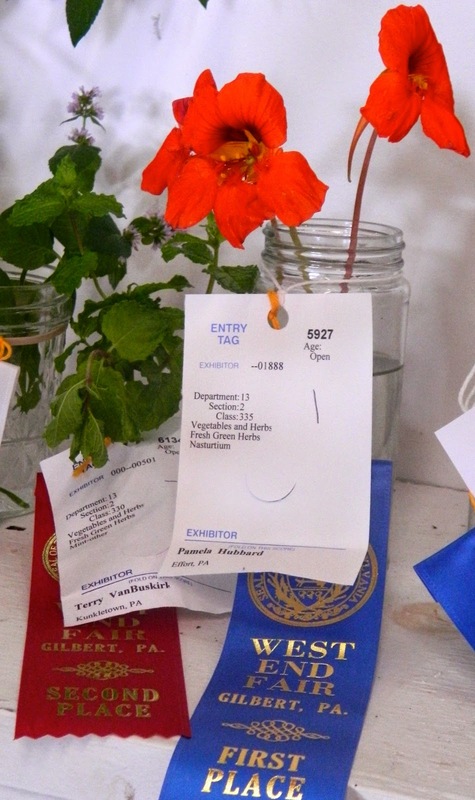 Plant breeders have developed many resistant varieties. 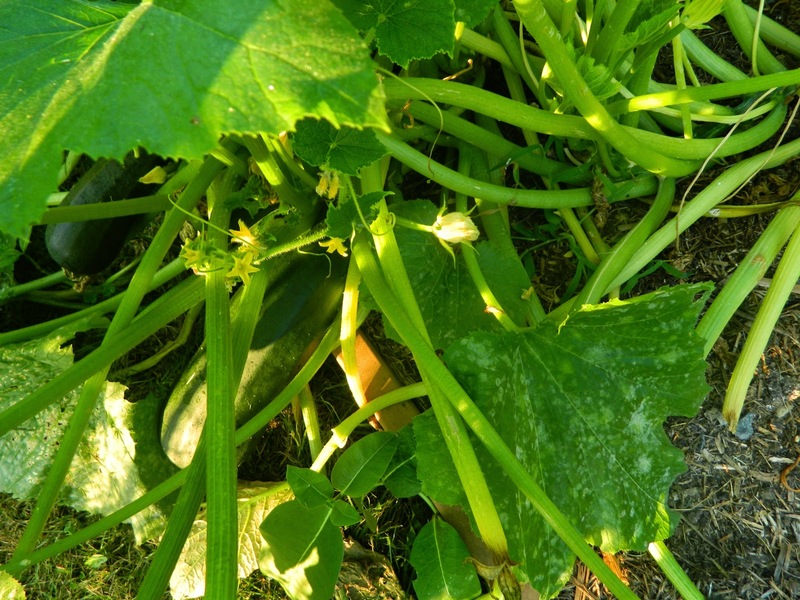 This does not mean the plant will not become infected, but the disease will be less severe or spread more slowly. 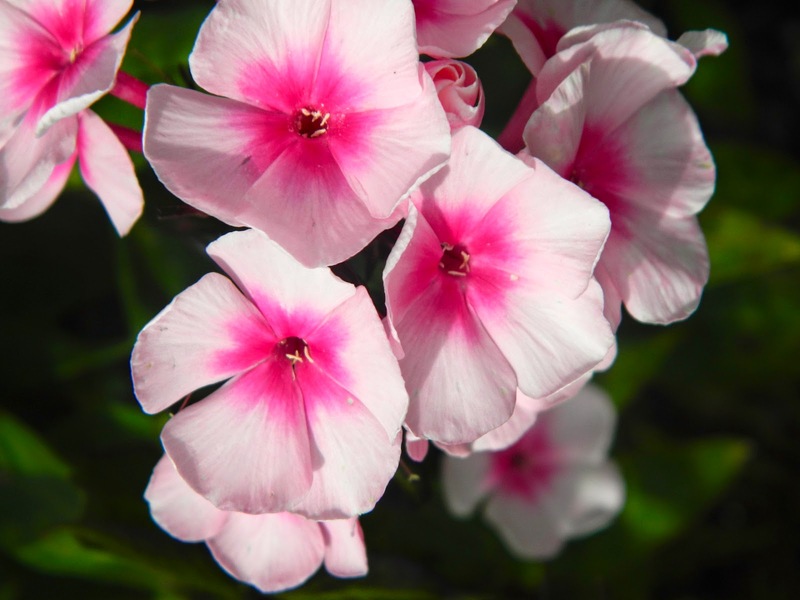 Phlox 'Bright Eyes' acquires but suffers little from powdery mildew because it is resistant to the disease. 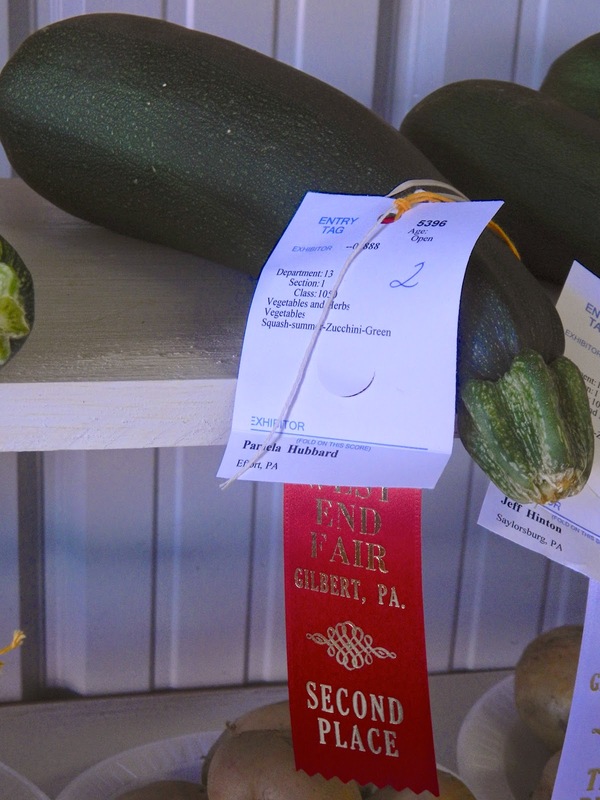 Powdery mildew did not prevent zucchini production or the quality of the fruit. 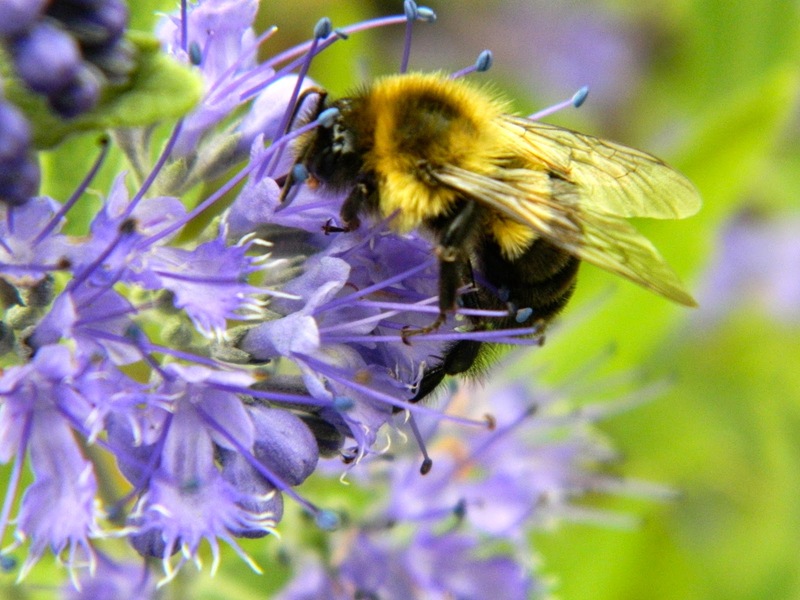 What garden pests and/or diseases did you contend with this summer, dear gardening friends? 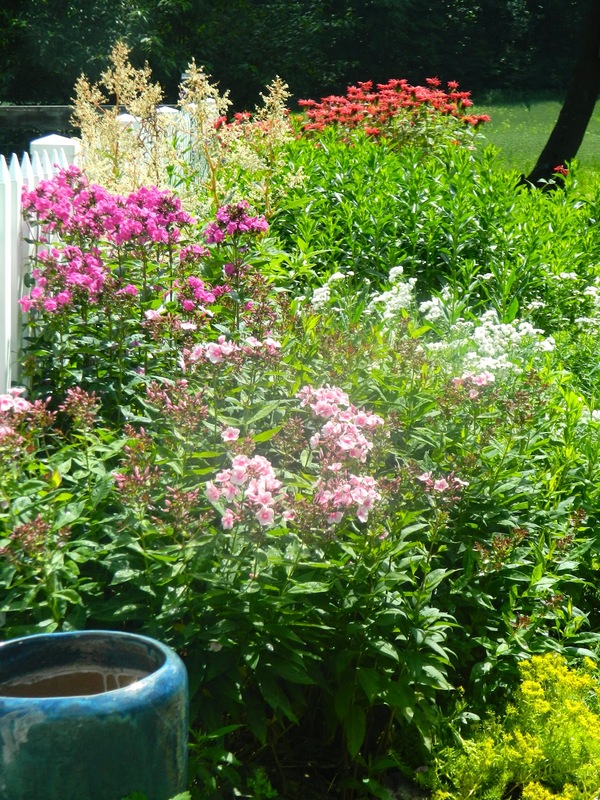 This posting was adapted from an article I wrote for eHow called My Phlox Has White Spots on the Leaves. 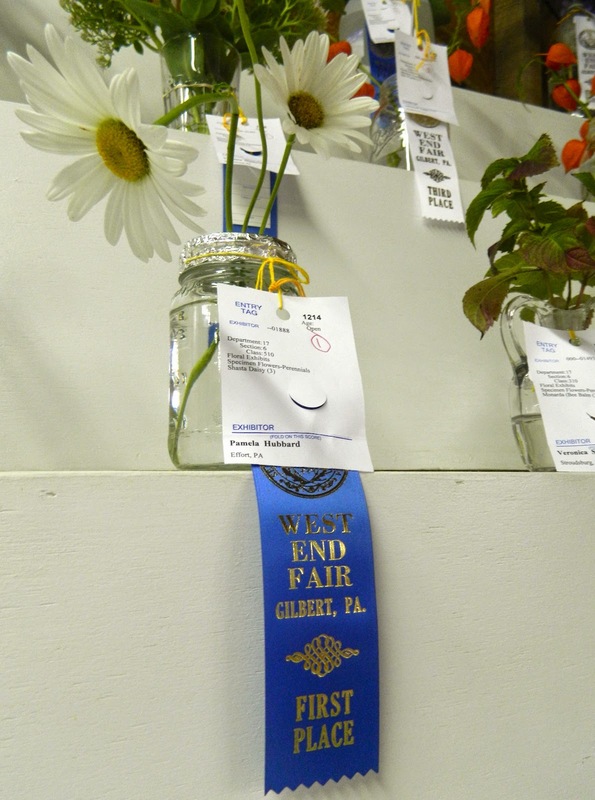 With the help of my eleven-year-old grandson, Jon, I took 12 first place ribbons at the West End Fair this year. 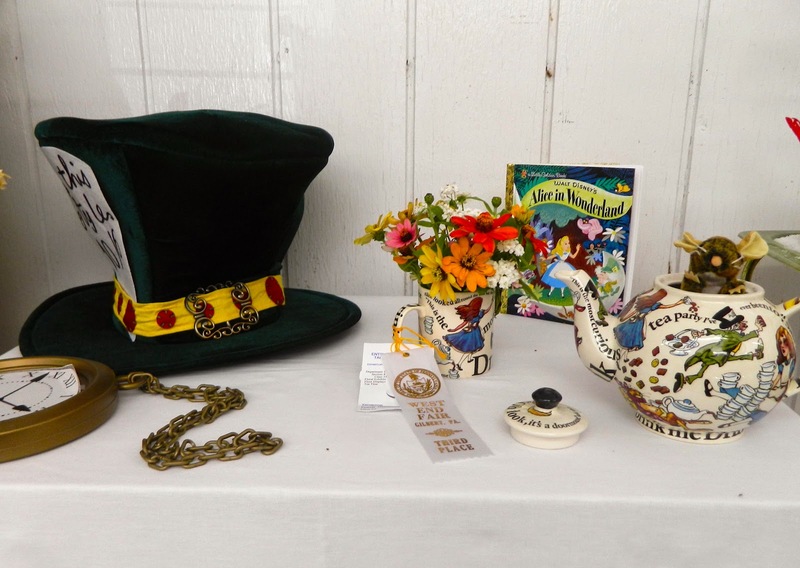 In fact I was awarded a ribbon for every one of my 28 entries. On the day we took the specimens to the fair, it rained and rained. Nevertheless, we were out in the garden early with Jon holding the umbrella over me while we debated the best blooms, vegetables, and herbs to pick. What would I have done without him? The process took several hours and we were MISERABLY wet. 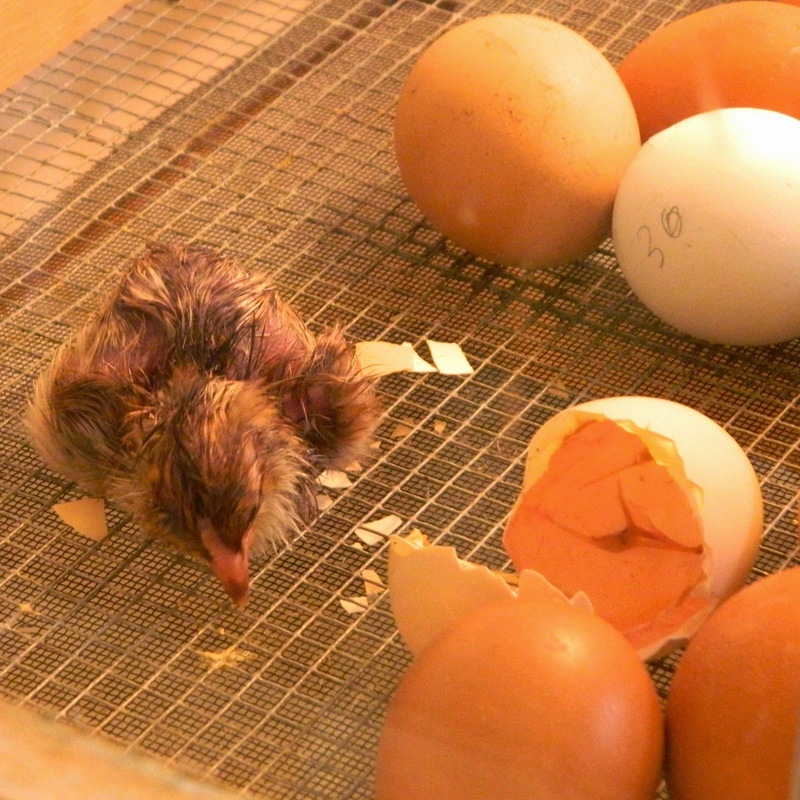 Like last year, Jon arrived the day before to help me prepare. Click here to see how he prepped the jars. 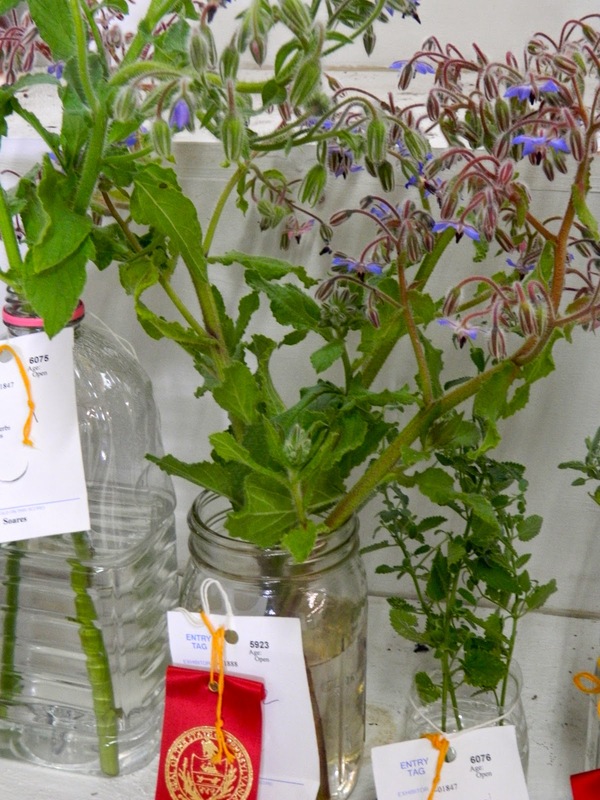 Specimen and container shall be clean, with insect damaged, dead or faded blooms/leaves removed. Judging shall be on the basis of quality. Judges shall consider condition and presentation. Fragrance and/or flavor characteristics of herb shall be important factors. Three stems uniform in size and conformation. Submitted in a clear container suited to the size of specimen. Remove leaves below water level. 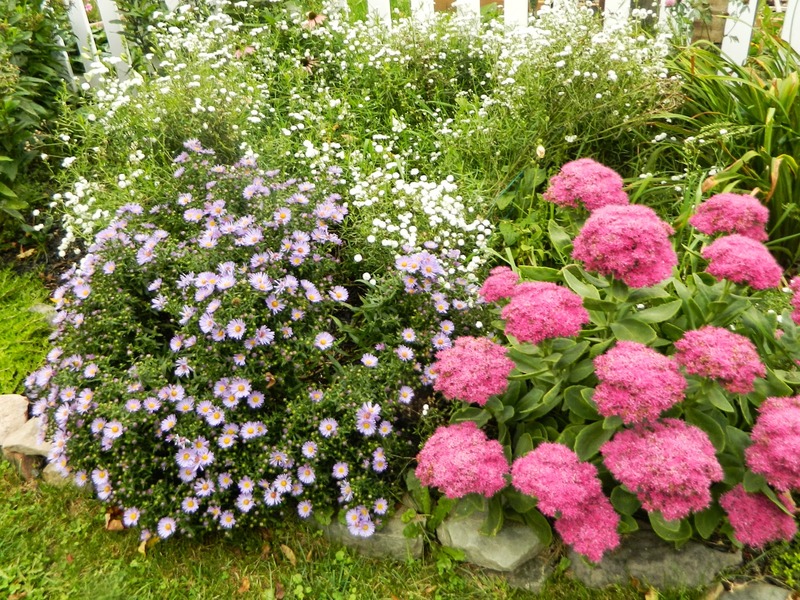 Herbs may be shown with leaves and flowers and/or fresh seeds. We followed the rules and were duly rewarded. 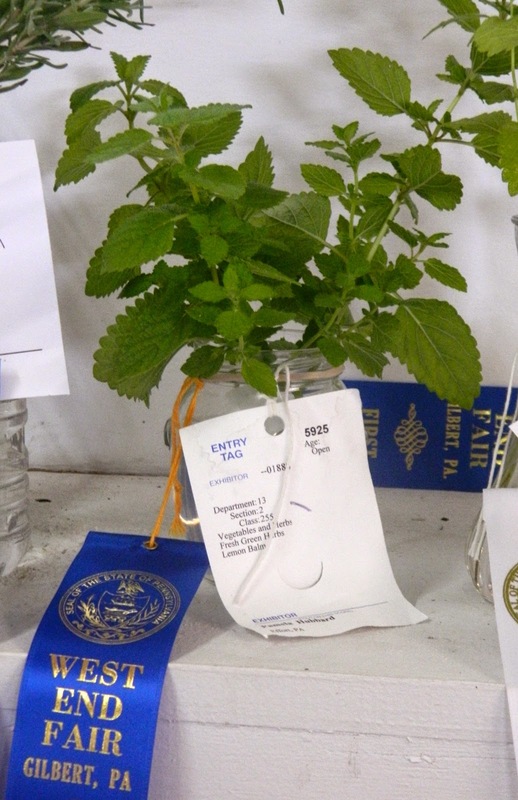 Lemon Balm with blue ribbon. 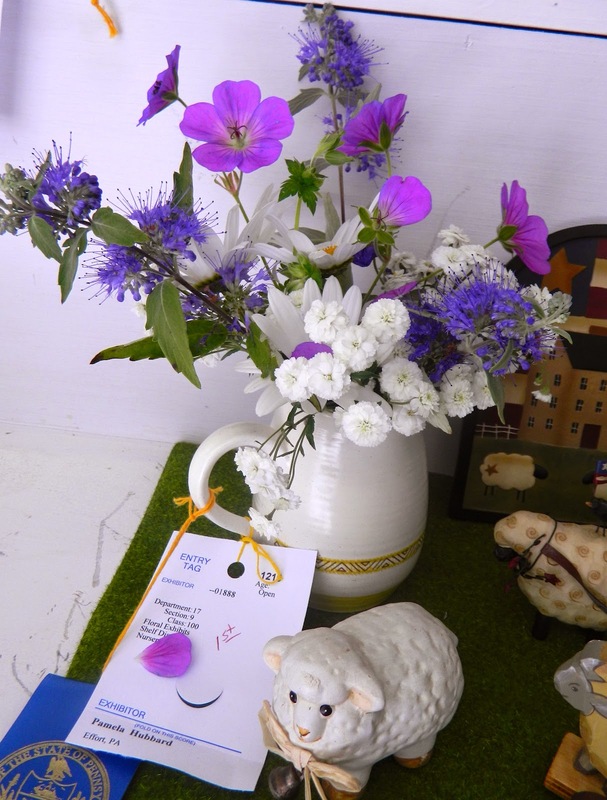 I grew borage for the first time this year and it did quite well with a second place. 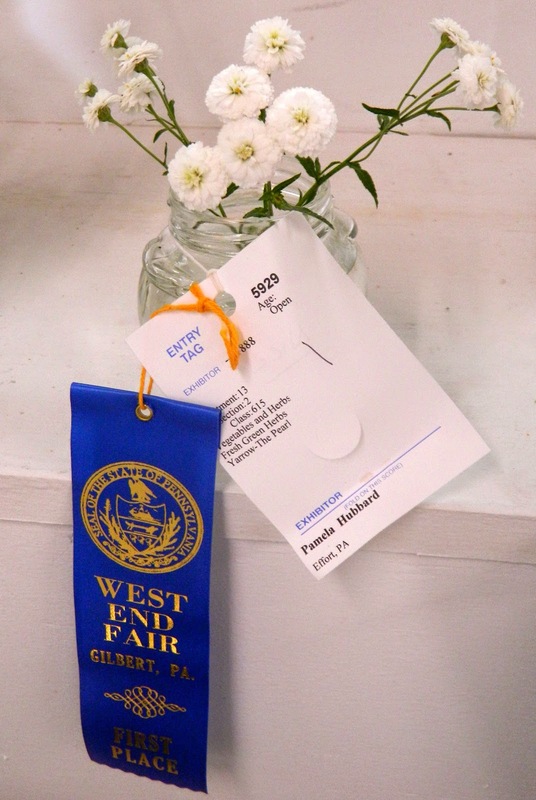 My reliable yarrow 'The Pearl' was included in the herb category and, like last year, earned a blue ribbon. 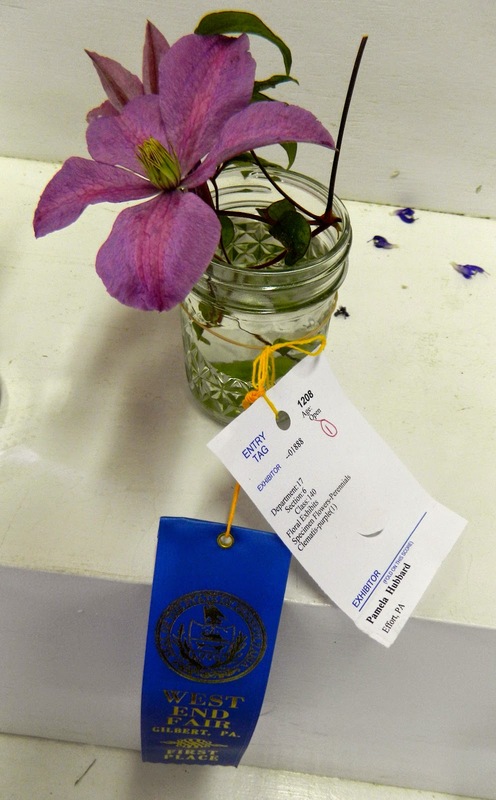 My nasturtium also won a first place. Achillea The Pearl (Achillea ptarmica). Nasturtium beginning to droop by the time I took the picture. 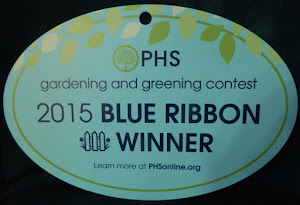 In the perennial section my clematis, hydrangea, Russian sage, and shasta daisy each pulled a blue ribbon. Amazing that I still had a clematis in bloom. Leucanthemum x superbum, commonly called Shasta daisy. 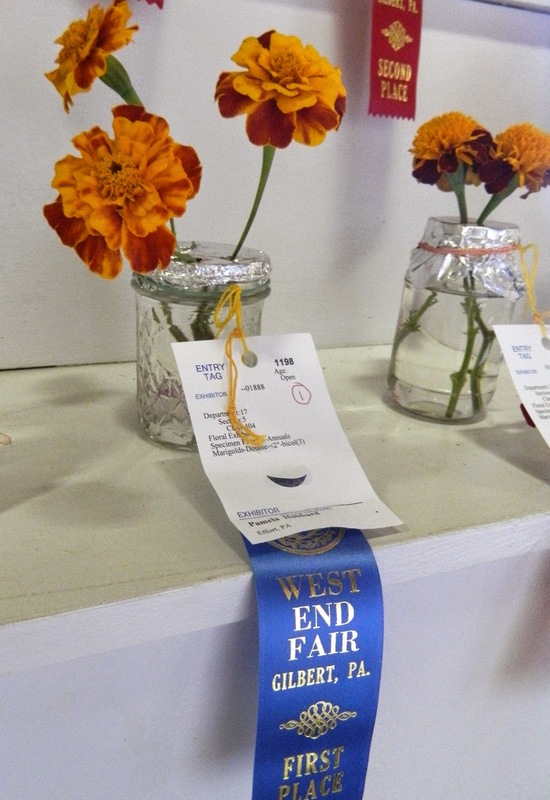 Among the annuals, the wonderful cleome that is so prolific in my garden this year netted a blue ribbon and so did my double marigold. 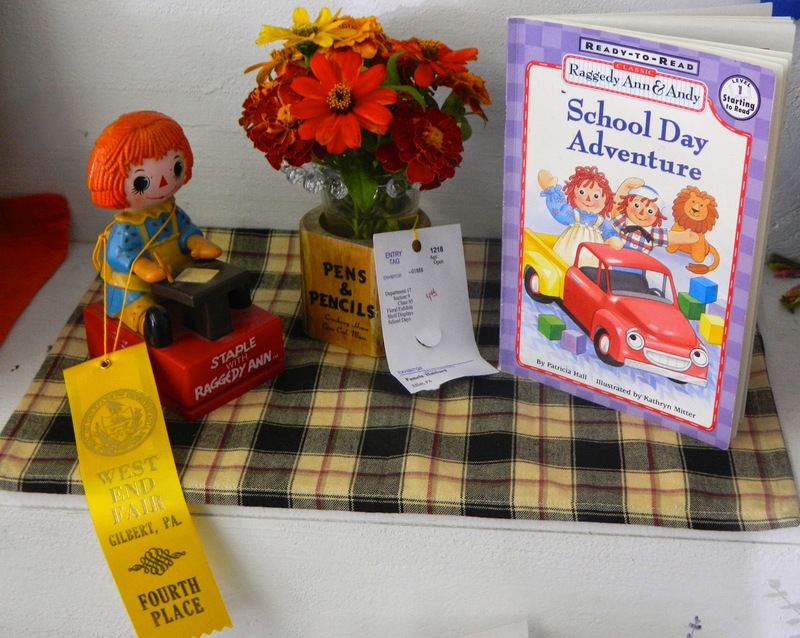 I used the marigolds and some orange zinnias in a shelf display 'School Days'. Jon enjoys the shelf and floor displays the most. He arranged the items to their best advantage and we got a first, third, and fourth. 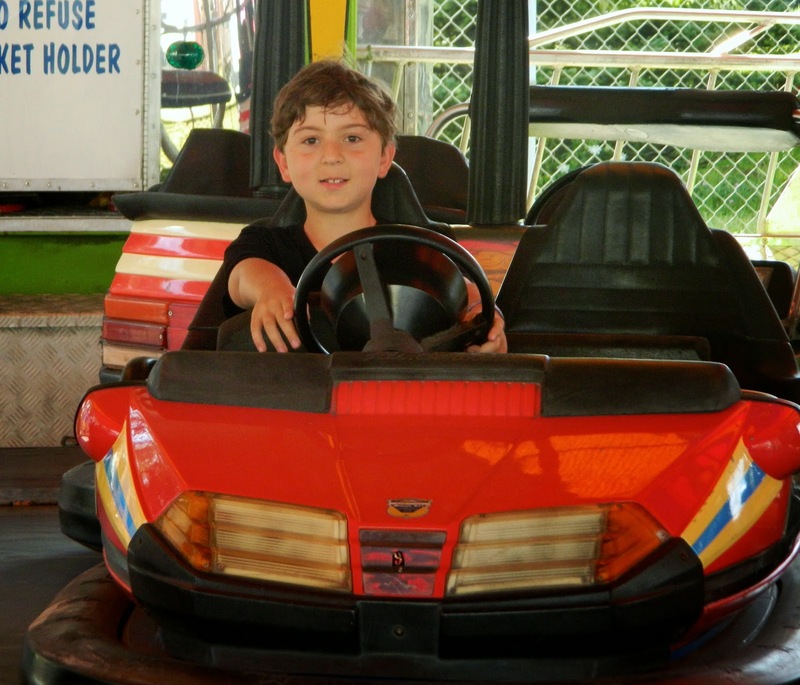 We sampled delicious fair food, listened to a country and western band on the main stage, and Jon was rewarded with a wrist band giving him unlimited rides! He deserved it. 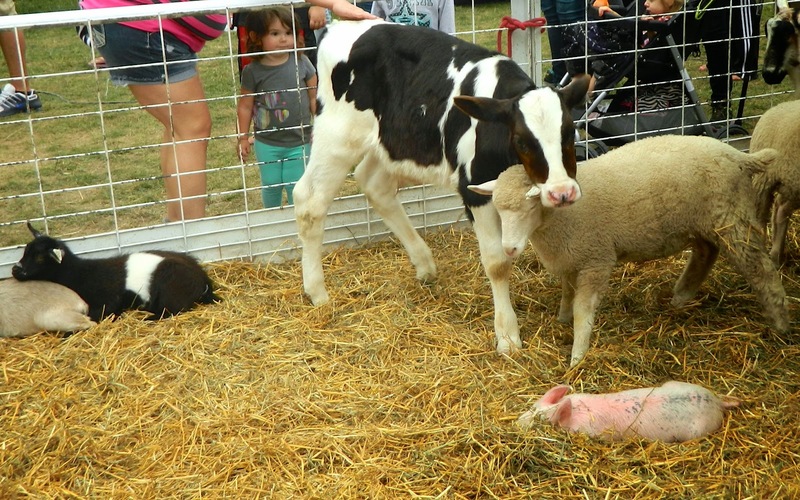 I am glad to say there was no rain during the week the fair was open. 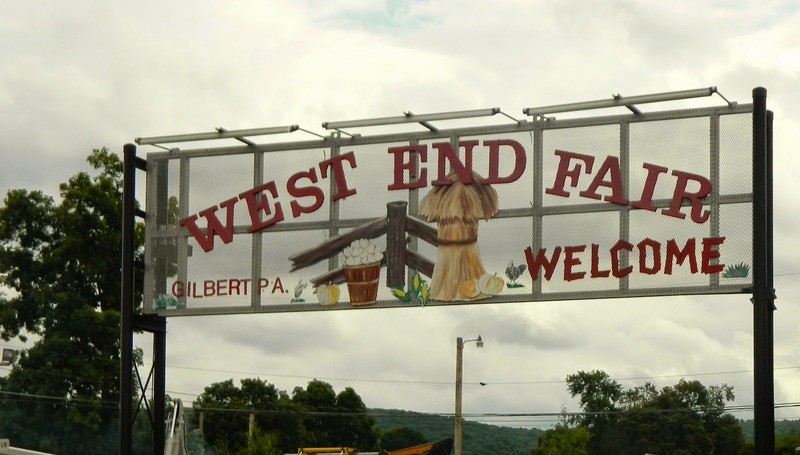 The West End Fair marks the unofficial end of summer here. Schools opened today. 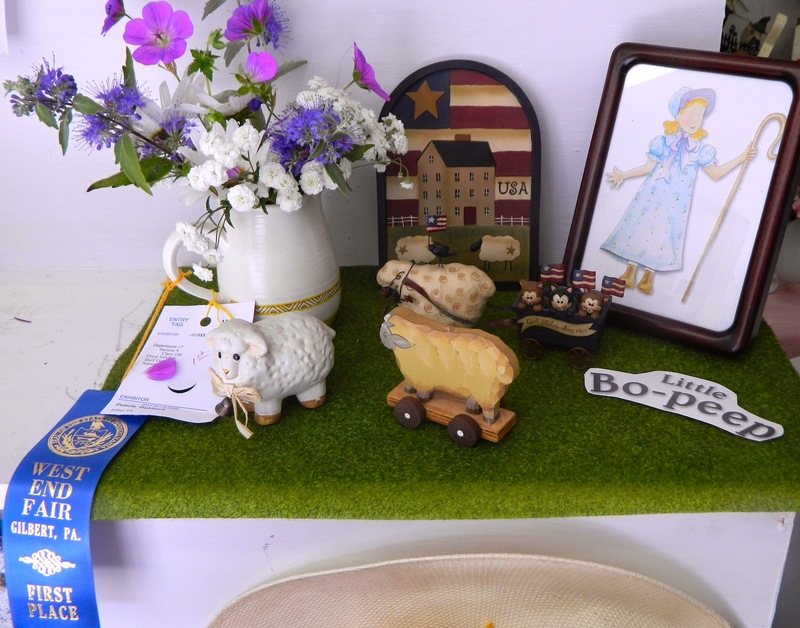 I am linking with Donna at Gardens Eye View for her 'Seasonal Celebrations' meme, as I did last year. Although this is a repeat, Donna, I can't think of a better way to celebrate the changes! 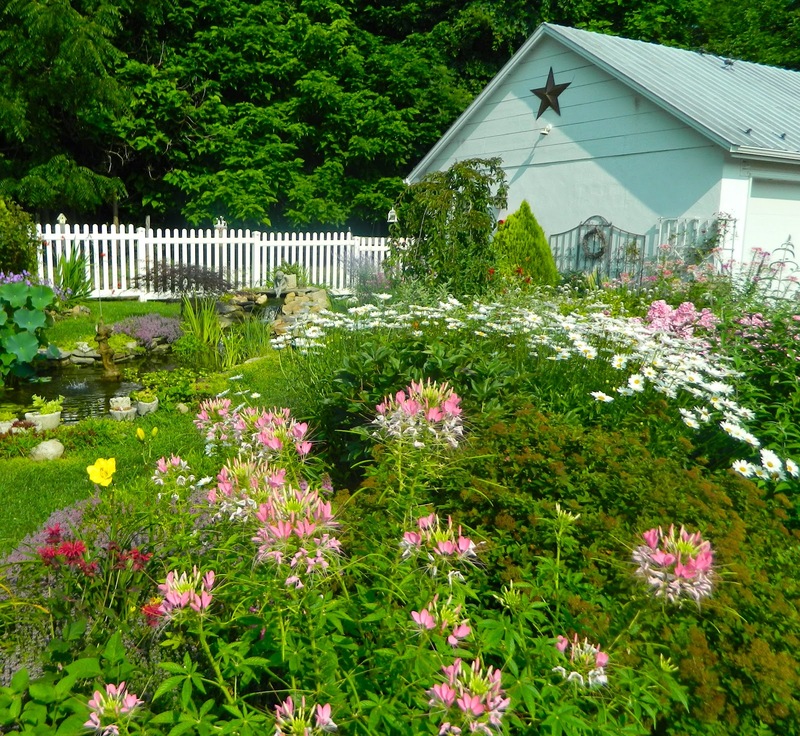 Enjoy your gardens, dear friends, as we celebrate this new season.